The perfect two bite Thanksgiving dessert recipe. 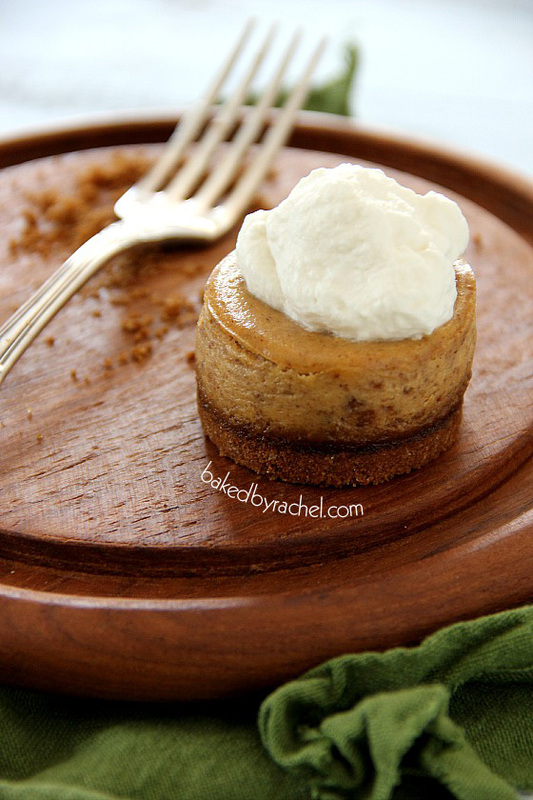 Creamy spiced mini pumpkin cheesecakes baked on top of a gingersnap crust. Every year making pumpkin cheesecake feels like a requirement. You’d think it’d be pumpkin pie but no, for some reason I’ve been making my absolute favorite apple pie and pumpkin cheesecake for as long as I can remember. We don’t have a huge Thanksgiving celebration with extended and distant relatives, so two desserts is usually enough. I know that sounds completely insane. One can never have too many desserts, right? I always make sure I save enough room for dessert. A slice of apple pie is an absolute must for me. I’ll forego everything else if it means having a slice of pie. Okay that’s not entirely true. I want rolls and stuffing and mashed potatoes and turkey and corn. Truthfully, I can’t give up any of it. It’s not possible. I’m the one stuffed when it’s all over. I’m sure you know the feeling. 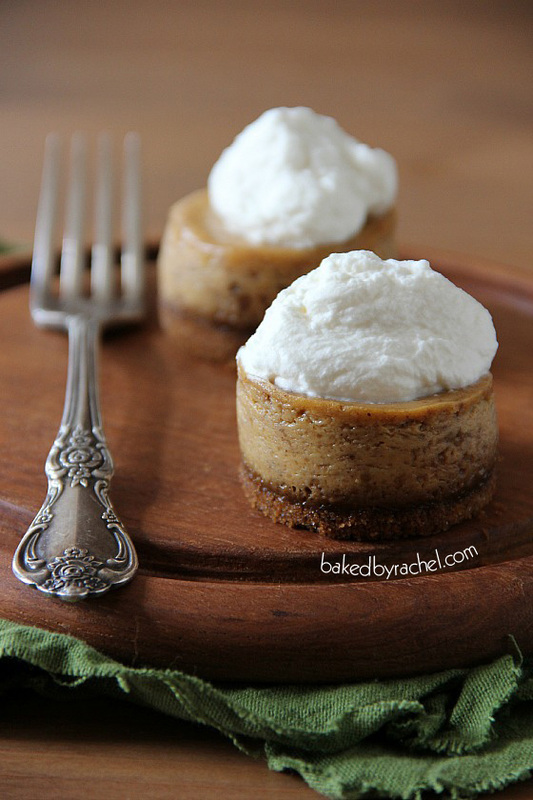 But back to these mini cheesecakes. I get in trouble when I make full size cheesecakes these days because I don’t eat them. *Gasp* Nope. Remember… I save room for pie. Every other member of my family will and does very happily enjoy the cheesecakes created though, but the little humans in our house are limited in their portions. So this time I opted for mini cheesecakes. Practically a two bite treat which would of course leave you plenty of room for insanely delicious pie. Smaller portions equal more room for variety. It’s worth a try anyway. So if you want a small version, make these. 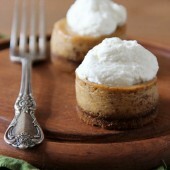 But if you prefer a full size pumpkin cheesecake, I’ve still got you covered. Both are crowd pleasers. The perfect two bite Thanksgiving treat. 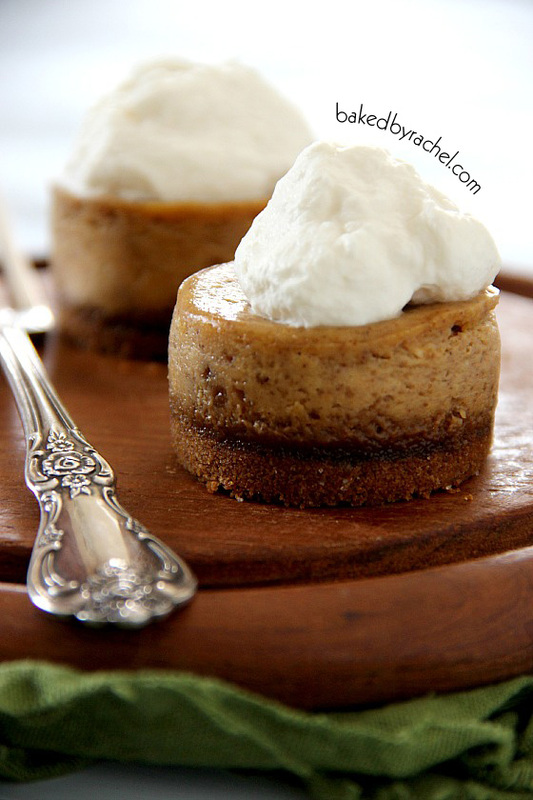 Creamy spiced pumpkin cheesecakes baked on top of a gingersnap crust. Preheat oven to 350. Lightly grease mini cheesecake pan with baking spray. 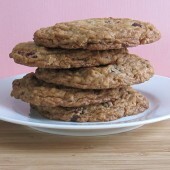 In a food processor, process cookies into fine crumbs. Add granulated sugar and melted butter, combining well. Divide equally among cheesecake pan cavities. Use a small flat bottom item such as a shot glass to press down on cookie crumb mixture. Bake for 5 minutes. Remove from oven and set aside. 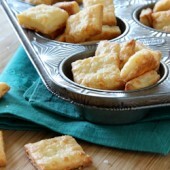 In a medium to large bowl, beat cream cheese and brown sugar until light and fluffy. Add pumpkin, sour cream, salt, vanilla and spices. Mix well. Finally, add egg mixing only until completely combined. Do not over mix. Divide among cheesecake pan cavities. 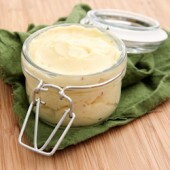 *Roughly 6 teaspoons or 2 tablespoons of filling per pan cavity. Using a small OXO cookie scoop, add roughly three scoops per cavity. Do not overfill. There should be a 1/4" gap between cheesecake mixture and top of the pan. Tap pan on counter gently to force any air bubbles to the top. Bake for 15-18 minutes in a 325 degree oven. Allow to cool completely on a wire rack before transferring to the refrigerator to chill overnight. Top off with optional fresh sweetened whipped cream prior to serving. When you think of turkey you think of Butterball, right? Well, not only does Butterball have a turkey hotline should you run into any trouble or have any turkey questions this year…because we’ve all heard those horror stories about burnt turkeys, undercooked turkeys and houses caught on fire from turkey mischief. It happens. Be careful. But, they also have a brand new app available through iTunes that is not only easy to use but it’s loaded with over 200 recipes perfect for Thanksgiving and year round. Forget Sudoku when I’m waiting in the school pick-up line, I’ll be torturing myself searching recipes and creating new meal plans. I’ve partnered with Butterball to make sure a few extra families will be able to enjoy a delicious Thanksgiving this year. Three Baked by Rachel readers from within the US will receive a Butterball gift check valued at $20. This giveaway is open until Friday November 9th, 2012 at 11:59 EST. Giveaway is open to US residents, ages 18 and older. Winner will be randomly selected and emailed. Winner has 48 hours to respond or another winner will be chosen. Main entry must be completed or extra entries will not count. **I’d love for these checks to go to people who really need them, whether it’s you or someone you know. If you win and don’t truly need it, please pass it along to someone who does. We’re playing by the honor system here. *Disclaimer: I was provided with an iTunes gift card to review Butterball’s new app. All opinions are my own. Giveaway is provided by Butterball. I am thankful for a (warm) place to call home (because geeeesh is it getting cold out in Maine)! I’m a homeowner of 2 years this week! I follow Baked by Rachel on fb! I liked Butterball on fb! I am thankful that I get to spend the Thanksgiving and Christmas holidays back at home with my family. I moved away in August and really miss them! I’m thankful we survive hurricane Sandy without any real damage when so many around us did not. I like you and butterball on fb! I am thankful for all of the blessings God has given me. I am thankful I get to see my family for Thanksgiving and that our house wasn’t damaged during Sandy. Losing power and refrigerator contents are nothing compared to our neighbors on L.I. and the shore. i’m thankful that despite all the difficulties that we have endured over the year that we can all still come together during the holidays and celebrate our love for each other. we’ve always had thanksgiving at my granny’s but they unfortunately lost their house, a house my grandfather built himself long before i came into the world… this will be the first year we aren’t going to be at my granny’s but i am still so very thankful that we have each other. i follow your boards on pinterest and i pinned this post. I am always thankful that I have a wonderful husband and a growing toddler. They are such a joy to me. I am thankful that my family and friends are healthy. I’m blessed to have them in my life. I am super thankfull to have finally gotten hired by tsa! I am excited to be a part of our nations security! So far my biggest problem is that I am brain fried and pooped by the time I get home from training so I need to maybe do some make ahead meals this weekend…will be looking thru you old posts for ideas! I follow you on Facebook but I don’t tweet or know much at all about twitter….sorry. My mother always cooks the family Thanksgiving turkey so I know she would love this. I am thankful for my family and a place to call home. I am thankful to be living in a free country where I get to choose what I want to go to school for and I’m thankful that I have a job that allows me to be able to go back to school. My kids. They are the best thing that has ever happened to us. I’m thankful for my two wonderful children, their spouses, and my four grandchildren! They bring such joy to my life. I am thankful for my amazing husband, my happy, healthy, and beautiful son, and my wonderful family who is always there for us and willing to help us when/if we need it. I don’t want to win the turkey- I just love the dessert! I am thankful to have my family around me.